When Ridgeview Liquor came to us, they were in the midst of building their new store. Their current website needed some improvements, and they needed a fast turn-around time to coincide with their store's re-opening. It was important they could showcase their new location, inside and out, as well as their passion for and knowledge of craft beer and wine. Our solution was to build them a Runwaysite to fill the need of getting a site quickly, and to build a full site further down the road. With their Runwaysite, they are able to easily update store pictures, any specials or promotions they are running, and prominently display hours and location through Content Management Tools. With Ridgeview in their new location, they wanted to ensure people knew where they were located, and what the change meant for their customers. DMI helped with their local search listing and updated search engines with their new address. DMI is also assisting with Facebook management, updating their images to coincide with their new site, and to let Ridgeview's customers know what is happening in store. If you consider yourself a craft beer or wine enthusiast, or if you're up to trying new beers, Ridgeview Liquor should be on your list of shops to check out. Stop in to say hi at 2202 S. Ridge Rd. 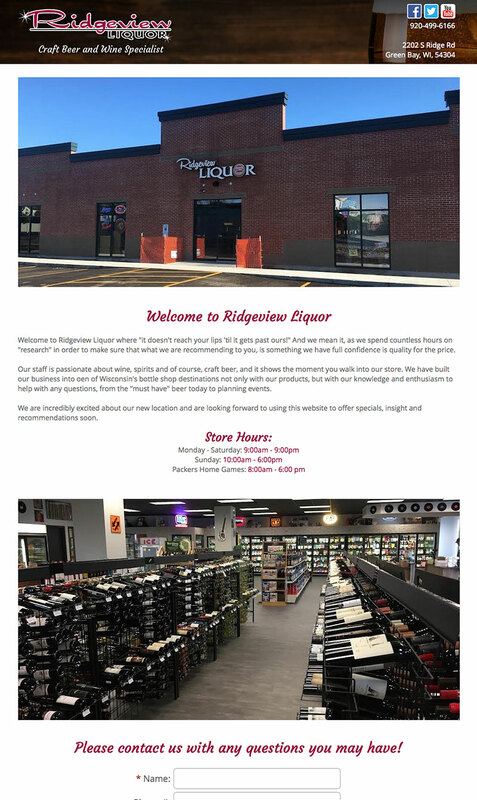 in Green Bay, and be sure to visit http://www.ridgeviewliquor.com. You might think that an online training system that provides courses for a wide variety of employees and situations in a large geographic area sounds like a pie-in-the sky idea--too expensive and too time consuming. You'd be wrong! DMI Studios' iGenius is an online training system that helped Construction Resource Management do just that! Construction Resource Management (CRM) is a Wisconsin-based captive service provider for three construction companies specializing in asphalt, bridges and overpasses: Payne and Dolan, Northeast Asphalt and Zenith Tech. These companies strive to provide top-notch infrastructure construction throughout Wisconsin and Michigan. CRM worked with DMI to develop websites for each of their companies and during the course of a general strategy session, the pipe-dream of web-based employee training came up. We suggested iGenius and the plan took off! In 2004, DMI Studios' created iGenius --a customizable framework that encompasses the essential elements businesses need in a training program--scalability, cost effectiveness and consistency. DMI built the iGenius solution to easily adapt to a multitude of situations including human resources, sales training, education, or any situation where a web-based learning program is needed. By implementing the iGenius solution, CRM now facilitates online training in a slide-show manner for their employees.. The training courses can incorporate any combination of audio, video, Flash, text and/or images. Each training session is then followed up with a test to measure comprehension. CRM can easily log in to the iGenius solution to see which employees have watched various training sessions, taken tests and quizzes and, ultimately, passed the course. Upload employee info and download employee course scores. Assign employees to courses or certificates (groups of courses) by company, area, job position or individually. Grant access to employees to take courses at any time, from any computer connected to the Internet. Create courses from existing or new materials. View reports that provide data on employees, courses and comprehension tests. Input offline course scores so all employee data resides in one place. In addition, the iGenius solution is tied into CRM's employee Intranet. This creates one central location for employees to take courses, get employee forms and info, view project photo galleries, and any relevant company information. In all, the iGenius solution has been a great asset for CRM. "Utilizing the iGenius system has allowed us to provide cost efficient, customized training to our employees," says Dawn Pratt, Human Resources Manager / EEO Officer for CRM. "In addition we are able to post documents, photos albums of workers, important information, benefit forms and a host of other important employee related information that creates a one-stop shop for our employees. It has worked out to be a very beneficial endeavor for both the company and the employee. Working with DMI has been a dream and they are so receptive to make it work just like we want it!" It's just one more way DMI Studios builds more than websites--we build business! If you'd like to see a test drive of the iGenius solution, we'd love to have you kick the tires, so to speak. Contact us today!